Whew! This week has certainly been a whirlwind! But it’s finally time to unveil the official 2016 Knit Dizzney yarn colorway, and we hope you’ll be please! We love it! The official Knit Dizzney 2016yarn, “By Hook or By Crook” will soon be available for purchase or pre-order! 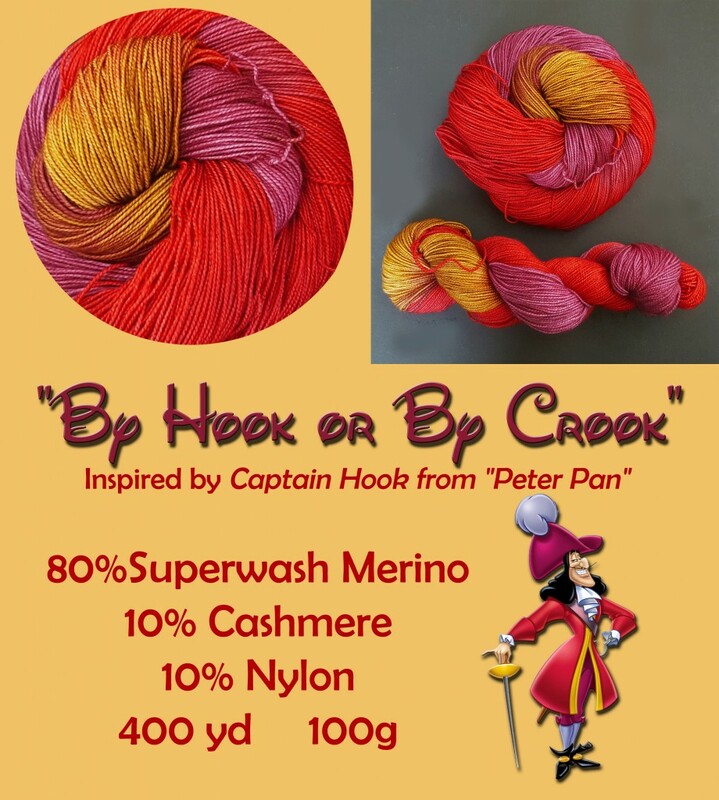 It’s 100 grams, 400 yards of luscious high-twist MCN sock, done in a diabolical variegation of deep crimson, exotic orchid with a touch of decadent gold. All this luxury for only $26. By Hook or By Crook will be dyed on an “as ordered” basis, so please allow 2-3 weeks for delivery. By Hook or By Crook is available to everyone, but for a limited time only. If you’re unable to attend Knit Dizzney, you will be able to purchase the yarn *here, starting July 15th until September 30th, 2016. Otherwise, you can pre-order by using the form that I will post shortly. Pre-ordering is only for those who will be attending Knit Dizzney 2016. Deadline for pre-orders is August 14, 2016. September 31st? The color way is beautiful!